THD XLR: 0.008% at 2.0V output. RCA: 0.008% at 1.0V output. S/N Ratio 60dB s/n at High Gain, Ref. to 0.5 mV input. 80dB s/n at Lo gain, Ref. to 5mV input. 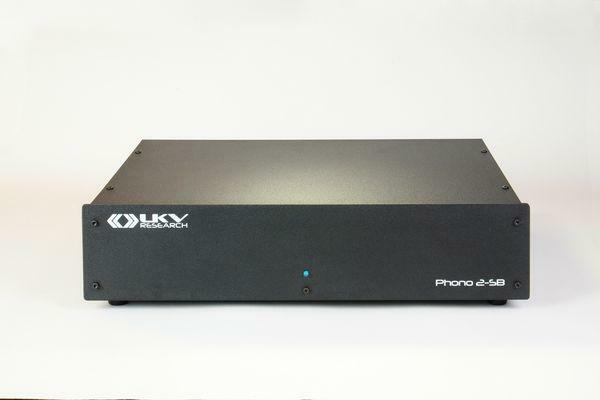 Onward with my recent series of phono preamplifiers, we are looking at the LKV Research Phono 2-SB in this review. This model is presented in two boxes, one for the power supply and one for the circuitry. Each unit is finished in a smart looking but very cost conscious steel plate chassis. I think the plain black pebble finish looks quite appealing, and I commend Bill Hutchins on focusing on performance instead of cosmetics. Multiple stages of power supply noise control using resistor/capacitor filters, capacitance multipliers and modern IC regulators. Ultra low noise active components (jfets and bipolar transistors) biased into their quietest operating ranges. Cascode amplification circuits and active current sources to assure low distortion in each amplification stage. Differential (balanced) amplifier circuits to block incoming noise. Signal path capacitors using accurate polypropylene dielectric to pass the musical signal without smearing. Four-layer circuit boards to keep signal paths short and improve grounding. 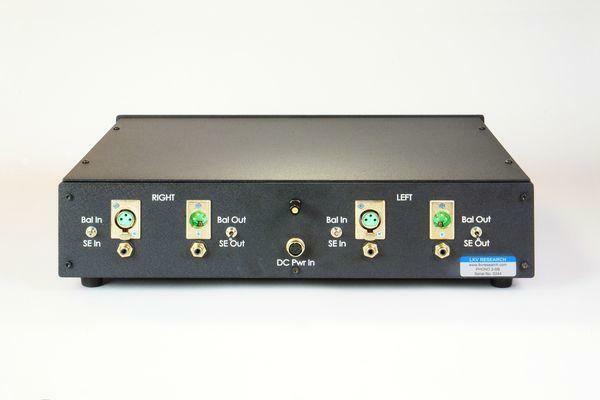 Three grounding options to minimize noise and avoid ground loop hum in a variety of systems. 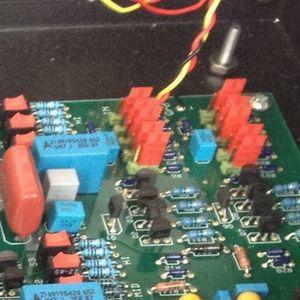 All discrete, Class A gain circuitry with zero loop feedback. RIAA filter, composed of precision metal film resistors and polypropylene capacitors. They are so confident you will love their products, that they offer a 30 day money back guarantee, you just pay the cost of shipping. However, I do have to complain about the controls for dialing in the gain and impedance settings. It is horribly inconvenient, all the switches are inside the chassis and can only be accessed by removing 4 screws from the top plate. Now this complaint is not just against this model, it covers many other reputed brands as well, and LKV's higher end Veros One model does offer controls on the rear. I'm not sure why, but Phono stages seem to particularly prone to inflicting this sadistic demand on the customer. Once inside, dialing the cartridge settings are done by 4 banks of switches for gain and 4 banks of jumpers for impedance. To make things worse, the instruction manual is not very clear in how to achieve the desired settings. If you are going to be using just one cartridge, and have the patience and steady enough hands to negotiate this process then this product can be a candidate. But if you like to swap out cartridges and/or do not have the patience or dexterity of fiddle with needle nosed pliers and jumpers, then you probably want to look to another product. All the tests were done using the Ortofon Quintet MC Black (review upcoming). For direct comparisons I had on hand the Lehmann Audio Black Cube SE Phono (MSRP $949 USD) and the Pass Labs XP-15 (MSRP $3,800 USD). I used my usual method of listening to small segments several times on one device and then repeating on the other devices, this entire process is repeated several times till the differences between the components are repeatedly and reliably noticeable. It takes me several hours to complete my listening on just one track. This outstanding album features perhaps the most talented Flamenco guitarist I have ever heard. And the recording quality is excellent to boot. This particular track is very complex and has lots of dynamics between the guitar and footwork. The Lehmann had a very fast and clean sound, the lower frequencies were a bit leaner than on the Pass Labs but just slightly fuller than the LKV. The Pass Labs was very clean between the notes, providing a distinct space between them. It was also the fullest on reproducing bass notes and thus the best at producing the full body of the guitar. The LKV had the leanest sound on lower frequencies, and was not as able to reproduce a convincing guitar body as the other two units here. This minimalist recording is a pressed on 180g single sided LPs, and is a great showcase for female vocals and several acoustic instruments. Again, the Pass Labs had the fullest sound when it came to the bass region, of the piano in this case. The rendition of female vocals were very slightly warmer and fuller than the other two units. It took me quite a few repetitions to reliably begin to notice the difference, so the magnitude was fairly small but certain. The Lehmann and the LKV seemed about tied in this test. Even after many repetitions I could not discern any significant difference between the two units. I use this track to examine the upper mid-range and treble regions, represented by the Tanpura and the Sarod respectively. The Lehmann had the snappiest response on transients of the three units tested here. Whereas, the Pass Labs had the softest response, and the LKV was somewhere in between the two. The intro on this track has a lot going on with several instruments and lots of dynamics and transients. While the double bass is beautifully played, but it's recording is a sonic hot mess, barely recognizable as the instrument that it is. The Lehmann again seemed generally to be the fastest and cleanest of the lot. Also it was a bit snappier on transients, and noticeably more detailed on top hats; brings out everything the track has to offer. The Pass Labs made the double bass a bit too boomy but otherwise the reproduction was rich and liquid sounding. The sound was a slight and euphonic softness to attacks on the piano and top hats. The LKV again was somewhere in between the two other units. This is a beautiful recording that I use to listen for performance on brass instruments. Lots of dynamics and "in your face" bark of the trumpet and trombone. The Lehmann was hard to tell apart from the LKV again on this test. The Pass Labs was considerably softer on the trombone and trumpet blats, making the instruments easier to listen to. Also on this track the double bass is not prominently recorded, but of the three units, only the Pass was able to bring out the instrument noticeably. I use this track to dissect the tonality of a solo acoustic guitar, with plenty of micro dynamics and soft passages. Also, this copy is very worn and is also used to inspect the playback of surface noise. The Pass Labs was a bit fuller on reproduction of the bass notes and body resonances than the other two. Whereas the Lehmann was maybe a shade better on transients and produced a smidge more detail than the LKV, but I have a low confidence on these differences. Other than the inconveniently placed gain and impedance controls, the 2-SB is a fine product. Sonically, it fell somewhere in between the Pass Labs and the Lehmann Black Cube SE, though in many aspects closer to the Lehmann. Power Amplifiers • Monarchy Audio SM-70 Pro, in monoblock configuration.